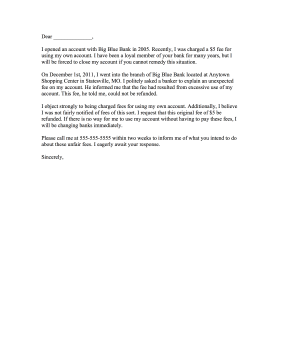 This complaint letter to a bank issues an ultimatum to refund an unfair fee or to close the client's account. I opened an account with Big Blue Bank in 2005. Recently, I was charged a $5 fee for using my own account. I have been a loyal member of your bank for many years, but I will be forced to close my account if you cannot remedy this situation. On December 1st, 2011, I went into the branch of Big Blue Bank located at Anytown Shopping Center in Statesville, MO. I politely asked a banker to explain an unexpected fee on my account. He informed me that the fee had resulted from excessive use of my account. This fee, he told me, could not be refunded. I object strongly to being charged fees for using my own account. Additionally, I believe I was not fairly notified of fees of this sort. I request that this original fee of $5 be refunded. If there is no way for me to use my account without having to pay these fees, I will be changing banks immediately. Please call me at 555-555-5555 within two weeks to inform me of what you intend to do about these unfair fees. I eagerly await your response.